The marketing function at financial institutions is being disrupted by new technologies and tools that didn't exist five years ago. 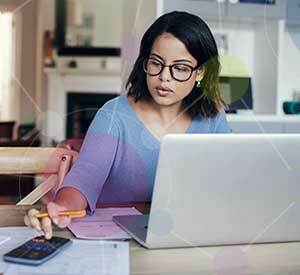 Banks and credit unions must now use data and advanced analytics to build more personalized communication and improve the customer experience. While changes in the banking industry are happening virtually every day, there may be no area of financial services where change is happening faster than in the marketing function. 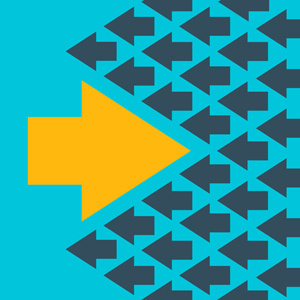 From new technologies to new channels and strategies, bank and credit union marketers must be both agile and willing to embrace change. As a result, it is important to review what will likely occur over the next year. 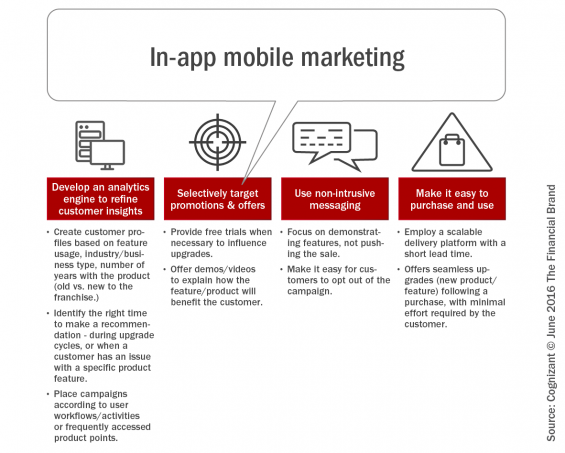 Improving the marketing communications process — from the consumer’s perspective — drives growth, loyalty and profitability. Managing the marketing process without taking advantage of the technology tools available is a recipe for failure. Last year, we reviewed the most important marketing industry trends that can’t be ignored by financial marketers. 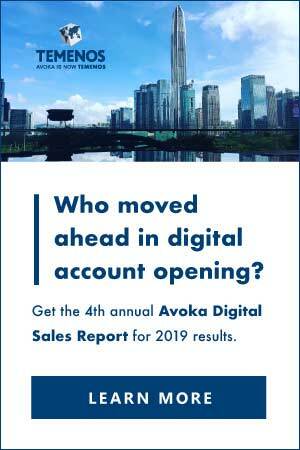 Unfortunately, according to research from the Digital Banking Report, many financial services marketers were not embracing or effectively prioritizing these trends. Hopefully, the year ahead will be different. Here is what we believe will be the most important financial marketing trends for the next 12 months and beyond. Machine learning (ML) and artificial intelligence (AI) have driven increasingly more efficient data analysis, making it easier for financial marketers to deliver hyper-personalization to consumers. 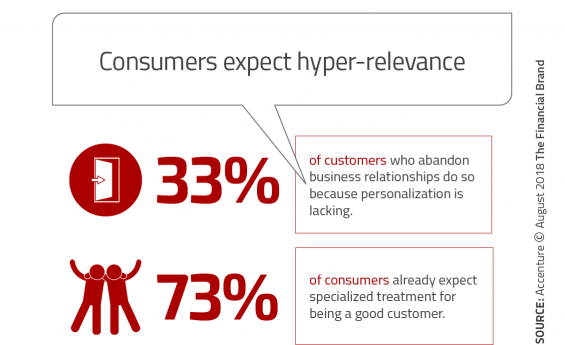 This personalization goes far beyond using a customer’s name, to personalizing content and creating unique customer journeys. Financial marketers will increasingly use predictive lead scoring, deploying real-time trigger campaigns to deliver dynamic content at every phase of the user journey. By focusing your brand on individual customer needs, engaging with useful and personalized communication, you will move from next most likely product to next most likely action. Consumers will turn towards brands who listen and learn from their behaviors and who create genuine relationships with them. In 2019, the consumer will control not only the journey, but also the conversation. Personalization will help banks and credit unions engage to enable true, authentic, customer-centric marketing. AI is becoming increasingly important to financial institutions. As they move beyond use in risk, fraud and compliance, artificial intelligence and machine learning are becoming mainstream technologies, and marketers must understand their benefits and uses. 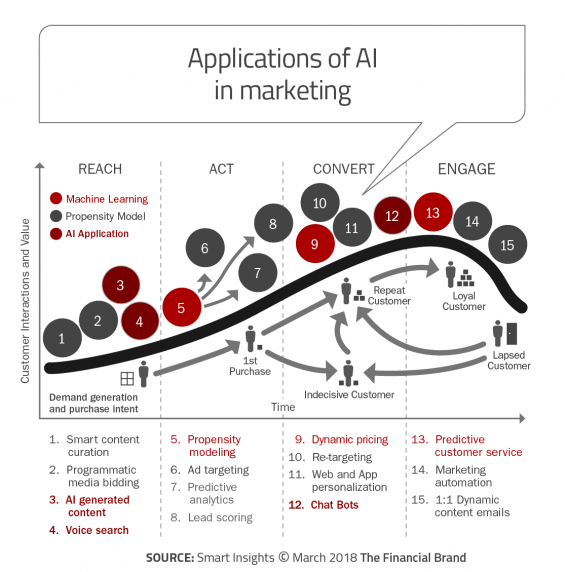 Every financial marketing organization should have an AI strategy in 2019. In the past, keywords and search histories were used to determine consumer intent. With AI and machine learning, banks and credit unions can identify intent automatically, using sources such as social media, transactions and behaviors to automatically match intent to offerings. Over time, we’ll see an increasing use of AI assistants in financial services to optimize media spend plans and even analyze creative components. AI systems will also identify market opportunities and create e-commerce solutions to satisfy them. This will be a component of the hyper-personalization movement. With the benefit of increasing amounts of data and the use of AI and machine learning, financial marketers will be in a better position to make predictions about the types of marketing strategies that will work for certain customers and automate the process. For those concerned about privacy issues — and all financial institutions should be — better collection and use of data for more personalized customer-centric recommendations will actually be welcomed by the majority of consumers. 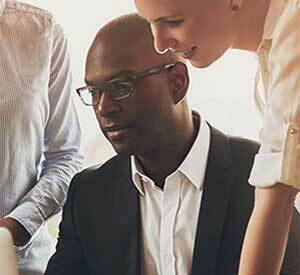 It is a great time to be a financial institution marketer. Skilled financial marketers are in high demand, marketing technology is advancing to help marketers make smarter decisions, and the prestige of marketing is increasing in most banks and credit unions. Unfortunately for financial institutions the demand for talent that understands new technologies far outstrips supply. This creates multiple challenges as we enter 2019, including increasing wages, difficulty for smaller organizations to keep the most qualified people and increasing competition for talent outside of financial services. As financial marketing continues to change, with greater emphasis on digital channels than mass media and other offline marketing tactics, the demand for traditional marketers will fall. 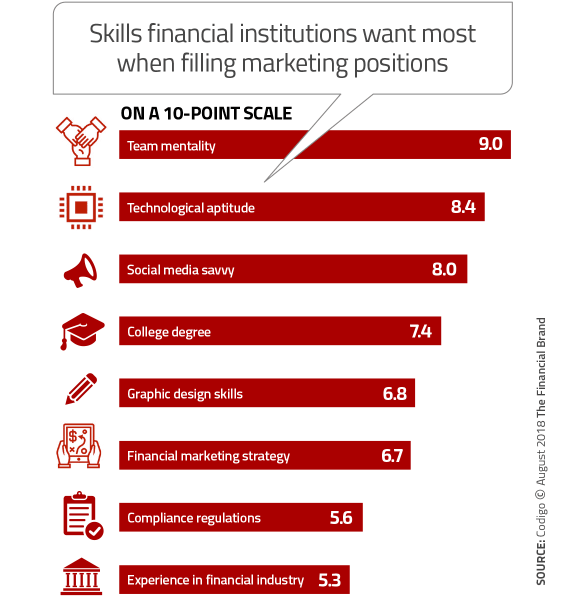 The leading skill sets that financial marketers hire for today are a team mentality, tech ability, and social media expertise. Graphic design skills rank below these, as does compliance knowledge. An applicant’s previous experience in financial services ranks lowest of all among the points Codigo queried respondents about — not unimportant, but no longer essential. This suggests that financial institutions are savvy enough to realize and accept that the level of expertise they need in new areas like data analytics won’t come from inside the industry. 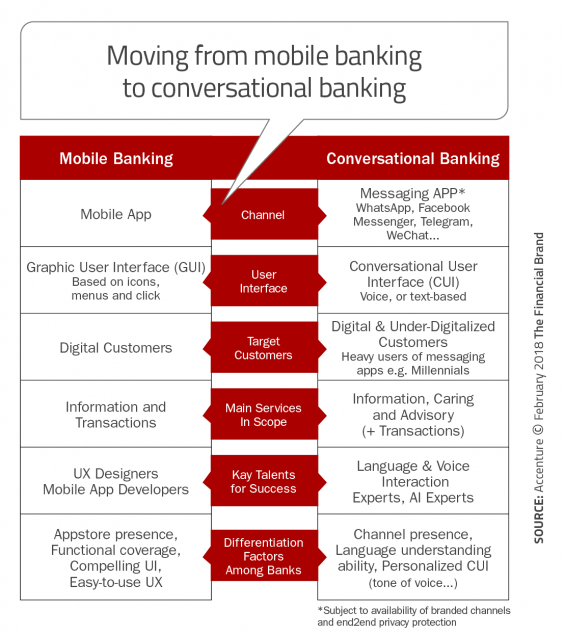 It’s safe to say that chatbot usage has now outgrown the hype phase in banking. The use of this technology is beginning to mature as a key component of online customer care and marketing. And, as with many of the trends taking hold in marketing, the use of chatbots shows no sign of slowing down. Initially, chatbots were used to replace human customer service representatives who managed predictable inquiries, routine tasks or frequently asked questions. They were also programmed to provide a bit more involved solutions as the algorithms learned from past results. Chatbots can be integrated with a website, an application, and even with a social media platform. They also gather user information that can later be used to better tailor financial marketing strategies. As banks and credit unions have become more comfortable using chatbots, more have used chatbots for personalizing advisory messages and increasing engagements with customers and members. In the next five years, approximately 80% of B2C communication will be performed through bot messengers. It is therefore imperative that financial institutions integrate chatbots into marketing strategies. By partnering with social influencers, financial marketers can reach built-in audiences of loyal followers with authentic and original content. According to research from #paid and Nielsen Consumer Insights, influencer marketing has a significant positive impact on brand affinity and purchase intent. Influencer marketing also allows brands to work around ad blockers, which are now used on more than 600 million devices. This is the underlying reason why influencer marketing has become increasingly popular. An influencer can support branded content, assist with financial education efforts, discuss benefits of new or existing products and help with search engine optimization. Done effectively, the integration of influencers as part of a bank or credit union’s marketing plan can have a positive impact on acquisition, cross-sell and loyalty efforts. Most importantly, having customers with a social media following “like” your brand and offerings can impact trust in your organization. Financial brands should test ways to engage with some or all of the influencers above to improve brand advocacy and loyalty with the Millennials and other social media active customers and prospects. 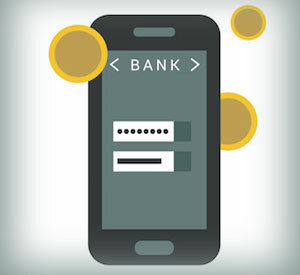 With more and more consumers performing search inquiries and accessing their financial accounts via mobile devices, banks and credit unions must rethink mobile strategies away from being simply providing account information, to being a way to inform, engage and advise on-the-go users. 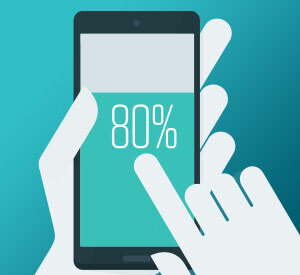 With more than half of consumers using their mobile devices first for anything that they require to do online, the mobile channel must be given a high priority in 2019. This goes far beyond making sure your site has been developed with mobile users in mind from a design perspective, but also impacts the content you provide. Think about the intent of people who are likely to search your website on a mobile device as well as those who will transact on digital devices. Make sure it is easy for the consumer to get the information that may be needed and to engage using real-time insights developed through advanced analytics. This article was originally published on November 26, 2018 . All content © 2019 by The Financial Brand and may not be reproduced by any means without permission.